Encouraging and increasing the involvement of graduate students and young scientists in radio science is a high priority of the USNC-URSI. Every full-time student at a U.S. university who is the primary author and presenter on an accepted paper is eligible to apply for travel support to attend the January National Radio Science Meeting in Boulder, Colorado. Every year, the USNC-URSI provides travel support to approximately 100 students. The USNC also provides travel support for students at U.S. universities to present papers at the periodic North American Radio Science Meetings (NARS). The Ernest K. Smith Student Paper Competition is organized at each National Radio Science Meeting. Papers are reviewed by representatives of the ten USNC-URSI commissions, and the top three authors are invited to present their research at a special plenary session. Awards are given for First Prize ($1000), Second Prize ($750), and Third Prize ($500). Funding for student travel reimbursement is provided by the National Science Foundation and USNC-URSI meeting funds. Information on the student travel support program and the student paper competition is available when registering for the National Radio Science Meeting. Please visit the conference website at www.nrsmboulder.org. Roughly two decades ago, the USNC-URSI began holding a student paper competition at its annual National Radio Science Meeting in Boulder, CO. This competition grew steadily in popularity, and in 2008 a similar competition was introduced at the international level. Competitions were held at the URSI General Assembly and Scientific Symposia (URSI GASS) in 2008 in Chicago, IL, USA, 2011 in Istanbul, Turkey, and in 2014 in Beijing, China, and also at the AT-RASC symposium in 2015 in Gran Canaria (Canary Islands), Spain. The USNC-URSI has sponsored the prizes for all of the four international URSI student paper competitions, and USNC-URSI members have chaired all of these competitions. Papers submitted to the competition undergo a competitive review process with judges representing all ten commissions. The young scientist must be the first author and presenter of the paper. In addition, a letter from the student’s advisor is needed. After the commission chairs have reviewed and ranked the student papers, finalists make oral presentations during a special session. Finalists are judged on both the content and delivery of their talks, and certificates and monetary prizes, provided by the USNC-URSI, are awarded. 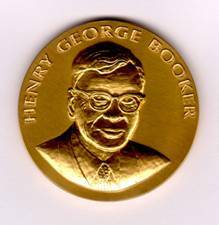 The Booker Gold Medal is awarded for outstanding contributions to telecommunications or a related discipline. The Booker Fellowship is awarded to an outstanding young American researcher and covers travel to an URSI General Assembly. The Dellinger Gold Medal is awarded for outstanding achievement in any of the branches of radio science covered by the URSI commissions. The Santimay Basu Prize is awarded for a prominent early career in the field.